THE UNARTISTIC ARTIST: Happy Christmas Eve! 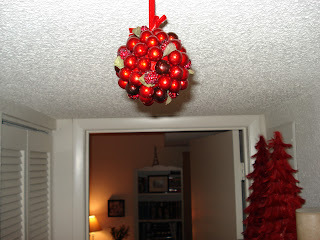 Instead of mistletoe I hang this "kissing" ball from Crate and Barrel (got it a few years ago) up in my apartment - isn't it cute? Anyway, hope everyone enjoys your Christmas Eve and finds this an encouraging and amazing time to remember the incredible thing that Jesus coming to earth was and how much it means to all of His people!